Celebrate our Scandinavian community! Open Saturday November 11 and Sunday November 12. 10am to 4pm. Enjoy strolling our wooded grounds, delight in the sights, sounds, tastes and folklore of a Scandinavian Christmas. We have created a wonderful opportunity for you to enjoy our private park and visit unique crafters inside of our tiny cottages. Into the Woods Handmade pottery by Karen Kloubec and watercolor prints by Peggy. Kathy McPartland's Cottage- Cottage in The Woods featured artist who makes all the signs and brochures for our event. See her painted cottage inside and out. She will have painted Cards, trays, ornaments... for purchase. Swedie Pies Bakery Scandanavian baked goods loaded with lingonberries, cardamom, almond and cinnamon. Dala's Deals -Gently used and new items, home decor and giftables. Great Deals! Svea's Sagas - Children's Story time (Times to be announced) This year the stories will be a celebration of the woodland creatures who live at the park. Sing alongs, a letter to Tomte can be written, and even mailed. Campfire Cones Delicious S'mores in a waffle cone cooked up over a campfire while you wait. Toasty Cheese Food Truck serving up scrumptious gourmet sandwiches. Worked Wood Wonders with Ron Diller carving, lathe turning, scroll saw puzzles, pyrography, wood toy vehicles and more. Voyager Saw Paul Van der Weide Intricate wood pieces. Holly Hus Donna Johnson garden designs lovely seasonal decor with fresh and silk flowers. The Children will delight in writing a letter to Tomte and meeting him too! The Friends of the Viking Ship will also be providing tours for 5$ . 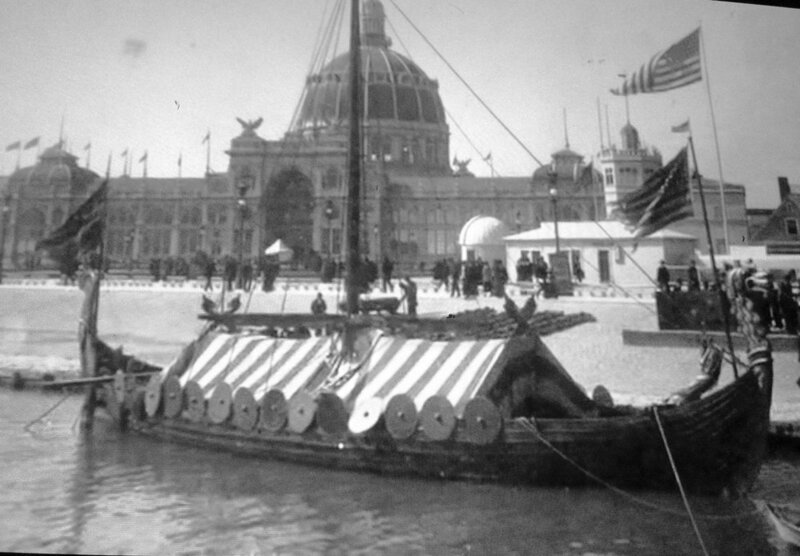 Viking ship at the World's Fair. Parking at the main gate of Good Templar Park 528 Eastside Drive, Geneva Illinois.